The main operating system is in the hibernation mode. The main operating system has been shut down incorrectly. The main operation system has been shut down with the the quick start mode enabled. Click Continue to mount the volumes in the read-write mode. This may cause corruption of the file system. Click Skip to mount the volumes in the read-only mode. Malware will not be disinfected in this mode. Click Reboot to restart the computer. 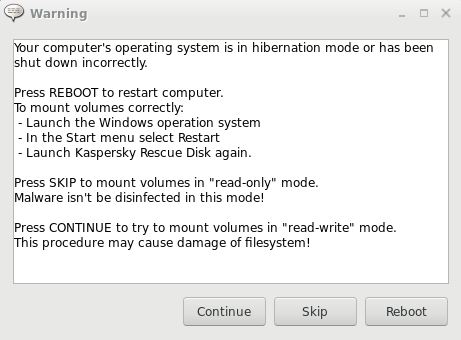 We recommend that you choose the Reboot option so that the operating system stops correctly using standard Windows tools, and then load into Kaspersky Rescue Disk.